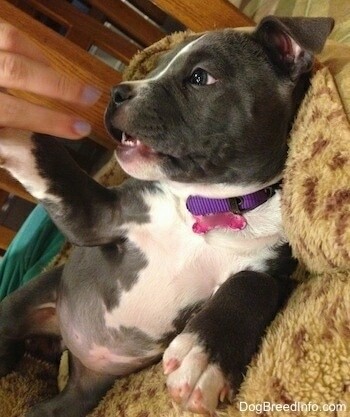 A day in the life with Mia the American Bully (Bully Pit) puppy. Mia's third week—9 weeks old, 12 pounds, 10 inches from the ground to the highest point of the shoulders(the withers). Bruno and Spencer's routines have been thrown way off. Just like me, they are exhausted because of the little piglet. She wakes up several times a night to pee and poop and she thinks early mornings are playtime. Pee, poop, pee, play, eat, play, walk, nap, pee, play, pee, eat, play, pee, poop, nap, play...and so it goes. Bruno and Spencer used to sleep in until about 9:00 a.m., when they would eat their breakfast, then lie around some more until it was time to head out for a pack walk. Now they are forced to get up bright and early at 6:00 a.m. for playtime and more playtime, breakfast, and playtime. If the weather is decent I will try and take them all for a morning walk rather than the usual afternoon outing. I had just taken Mia out to pee before putting her in her crate for the night. I was only in bed for a few minutes. "Yip!" Already? I know better than to ignore her yips. I went back downstairs and took her back out. Mia walked under the bushes and pooped. Yeah, she's got a thing for those bushes; she's been pooping under them. It's a good spot. No one will step in it under there. Good girl, Mia. At 1:00 a.m., "Yip!" I popped out of bed from a deep sleep, almost running into the wall. When I reached Mia's crate she was sitting down looking at me. I opened the crate and patted the floor. "Come on, Mia, do you have to go pee-pee?" Mia moaned a short moan and plopped back down. Oh no, you don't. Last time I let you do that it didn't work out too well. I scooped Mia up and she peed and pooped outside. It was 37 degrees out with no wind. It was rather nice outside and Mia sat down, staring off into the distance like she was enjoying the night. "Come on, Mia, I'm so tired!" Mia started nosing around. Was she going to poop again? She went under the bush and I tried my best to see what she was doing. I watched for a while in case she was looking for a place to poop or something. She was now snorting as she licked the ground. Darn it, she was looking for someone else's loot, not trying to leave some of her own. "Miaaaa let's go!" Mia climbed up on the porch and I thought she was on her way in when she stopped at some bird poop and began cleaning it off the porch. I scooped her up and walked her to the yard one more time to make sure she didn't have to potty some more. Mia's nose went to the ground and she headed straight back to the bird poop. "Mia, you're a Bully Pit not a Beagle! Quit sniffing things out like that." I scooped her up as she proceeded to clean the loot from the porch with her tongue. I lured Mia out the door to pee with a tasty treat. As soon as she jumped off the single step leading from the house to the porch she squatted and peed. Wrong spot, Mia. Close, it's outside, but not far enough. I didn't tell her no because I didn't want to confuse her. We will be working on this. Things must be done in small steps. It was one of the warmer nights with temperatures in the 30s F.
Mia was sleeping. The kids walked in, waking her up. They sat down on the floor and started playing with her. I said out loud, "I have to take her to pee since she just woke up." I decided to give her another minute with the kids. Mistake. Mia suddenly just squatted right next to them. I quickly picked her up and ran outside where Mia squatted again in the exact spot where I plopped her. That'll teach me. No more playing just a little longer right after a nap. Stephen and I were both watching Mia as she played with her toys. She was so cute. Suddenly, without warning, she just peed on top of them. Oh my gosh. That was so random. She did this, pee without warning, a couple of other times. I had found another dried up pee in the dining room, too. Hmmmmm, something is not clicking into this pup’s head. The most effective way to get Mia to stop puppy biting is to yip at her. She responds very quickly, turning the bite into just a lick or she stops altogether. That is a sign she does not want to hurt anyone. Good girl, Mia. I was having Mia ride on the floor of the front passenger side of the van since she is not potty trained and I wanted to watch her to make sure she was safe. Mia would lie down in the little bed I would put on the floor for her, but she was not happy about it. It was not that she didn't like riding there; she just wanted to be with her brothers. If Bruno and Spencer were in the front it would be her favorite place to be, because Mia's favorite place to be is anywhere Bruno and Spencer are. OK, OK, Mia. I will try letting you ride with your brothers. Just don't pee! Mia settled right in. "Mom, is the squirt going to be back here now?" Yep, this is what Mia wants when we travel. "Oh, Bruno, you're the best." Mia slept through the night for the first time! At one point I woke up and wondered if she was OK. She had not woken up yet. Then I decided that was silly. At some point she is going to sleep through the night. If I go down to her crate and wake her by checking on her I might teach her that I want her to wake up. Sleep, baby-Mia, sleep. She was up bright and early at 6:00 a.m. for playtime! "You see those horses over there, kid? Don't be running up behind them ’cause if you spook them they will kick you into the middle of next week. Are you listening to me? Don't go learning things like that the hard way. I'm trying to save you some grief here." "Bruno, Spencer, come quick! I found some major loot!!!" "Oh no you don't, Mia. That pile of horse poop is bigger than you are. Stop eating that!" We also had to put a board across the bottom of another gate to stop Mia from squeezing under and exploring the lower part of the farm unsupervised. She's still so small she can squeeze into places the big dogs can't get to. “Mia, hey, NO!" Don't chew Robert. Bad puppy! Robert was given to me as a birthday present from my husband in 1988. He was named after the lead singer of Led Zeppelin. Get it? Robert Plant. That was the joke when the gift was given and he's been Robert ever since. Oh no you don't little Mia. Stop trying to steal his bone. There you go. Chew on your own bone. Something does not seem right with this picture. The pack is coated up and ready for a night walk. During one of the walks, Mia stopped at the curb and began to whine. She's gone down higher steps, but this was a new step and she was not so sure about it. I paused to situate the things I was carrying into my pockets. Before I had a chance to say or do anything Bruno walked back to her and nosed her. "Come on kid, you can do it." I am not even sure he made actual contact. It was definitely an encouraging gesture. Not too long after her curb adventure, she was ready to be carried. Mia walks for a while and I watch for signs that she has had enough. I test her out by stopping often. When she's had enough, she will sit down facing me and whine. Jacket time. It's OK, baby Mia. Mammas got you. I love the snow. Storms are always very exciting. But this time there is a puppy to worry about and Mia does not like going outside in the cold. That does not make housebreaking an easy task. It's already been difficult, but now there was a storm rolling in with temperatures reaching the low single digits, a wind chill into the negative teens and over a foot of snow. It will be challenging trying to get her to potty outside. I shoveled out an area for her to do her business. The snow was coming down hard. I had to go outside several times to remove the new snow out of her spot. When she has to go, I won't have time to get out the shovel to clear it. Mia was not happy about the white, cold stuff falling from the sky. She shivered and whined. Mia looking at the snow as it falls. Come on Mia, go pee-pee so we can go back inside. Wait a minute. Spencer, how can you just run around like that? I can't even get out of this shoveled square. How am I supposed to run around finding loot with all the cold stuff piled up so high like this? As soon as she pees I scoop her up into my jacket. It is dangerously cold outside for a puppy this young with such a short coat and a bare-skinned belly. The wind chill is negative 14° F and she is shivering. The kids were in the kitchen with Mia. Silly me, I assumed that meant they were watching her. She pooped inside for the first time. She not only pooped, but she peed. Darn. All of the deep snow is messing up our housebreaking. I knew Mia had to poop because of the amount of time that went by since her last movement and the gas she was passing. She was heading for the dining room. Oh no, you don't. I took her outside. Mia whined. "I have to go, but not out here. It's freezing, wet and windy!" I could only keep her out so long. It was not one of those times you can hang out until it happens. It was too cold and the snow was coming down. Mia had to poop, but she didn't want to be outside. I brought her in and held her for a while. I let her be in her bed right next to me and at one point she was also in her crate. But she could not run free until she went. She whined while being held which always means she has to go. I took her out again. We must have done this 4 times before she pooped. Good girl, Mia. It took us a while before she would pee too. But we finally got it done by going back and forth. We had gone outside a lot to try and get her to pee and poop before bed. She was in and out of her crate. She just would not settle and that was unusual. She usually goes right to sleep at night. Then I realized her crate bedding was wet from the snow on her paws. Could that be it? Could that be what is keeping her from settling in? You poor baby. I flipped the bedding so it was dry side up. Mia immediately lay down. That was it. All the yips were trying to tell me her bedding was wet. At 1:30 a.m. Mia yipped. I went downstairs and slipped on my boots and coat before opening her crate. Mia was sitting down looking at me. "Come on, Mia". Mia lay back down. She had to pee but she didn't want to go outside. "Oh no, you don't. Come on, baby." I shoved her completely into my down coat and walked to the pee spot before placing her down into the area we shoveled for her in the grass. Mia tried to run back to the door and I caught her and placed her back in the potty area. "Pee, MiMi." Mia squatted and peed. As soon as she was done I put her back into my coat and headed back in. At 5:30 a.m. Mia yipped in her crate. I took her outside in my jacket, only getting her out when we reached the pee spot. As soon as we stepped outside she started whining. It was freezing out with wind and snow drifts blowing around. I set her down and said, "Mia, go pee-pee." This time she caught on quickly and squatted, then walked over and stood between my legs to be picked up and put into the jacket. I took her back inside all wrapped up. It's too cold for a little puppy to be out for long. I put Mia back in her crate and headed back upstairs. Maybe she would go back to sleep. "Yip!" Maybe not. I bet she has to poop. I took her out with no success. I brought her back in and put her into her crate. She whined at me. I know she has to poop. It's morning. I decided to let her out of her crate and watch her very closely. She headed to the corner of the living room and was about to poop. "Oh no, you don't. Not there!" I picked her up and ran out the door, placing her down in her shoveled potty area in the snow. She tried to walk back to the door but I blocked her. Mia walked to the other end of the area and pooped, then walked back to me to be put into the coat. Good girl, Mia. I guess we are up for the day. Yay! The wind died down and I was able to lure Mia with a treat out the front door and to her potty spot where she peed right away. Good girl, Mia. To successfully housetrain a puppy you have to make them walk to the door, then out the door and to their pee area on their own without carrying them. In frigid weather this has been difficult. It is currently 16° F outside, but there is no wind and I was able to lure her out with some freeze-dried chicken. Add in some wind, snow or if it is any colder and she just won't willingly go out the door. Not even for chicken. She does not have any fur on her belly, nor does she have an undercoat to keep her warm. She gets cold very easily. Every chance we get, we make her walk the walk. When the weather lets up just a little this should get easier. Teaching a puppy to show you they have to go by walking to the door is very important. Otherwise they will just stand in the middle of your living room and wait for you to take them. When you don't take them because you don't realize that is what they want, they eventually go to the bathroom inside. The more they pee or poop inside the house the harder it will be to teach them as they will not only form a bad habit, but they will smell their waste even if you can't. In Mia's case with this bad weather we are having she does NOT want to go out the door. So luring her to the door teaches her that if she walks to the door she goes out in the freezing cold, windy snow-drifting weather, a place she does not want to be under any circumstances. There is no way she will willingly ask for that. Mia had just been out to pee. Good girl, Mia. She ran back to the door to be let inside. Once inside she started walking around. I was following her. She reached her toys. Oh good, she's going to play. Suddenly she began to poop on top of them. What??!! "No!!!!" I grabbed her mid-poop and ran her out to the shoveled potty spot where she proceeded to finish pooping. Mia, I know it's 4° out with the wind chill of negative 14, BUT that does not give you an excuse to poop ON your toys. What a trick! I threw all the cloth toys in the wash with bleach just in case there was some smell on them that drove her to do such a thing. Having a puppy during a snowstorm is exhausting. I hope it gets warmer outside because we all need a nice, long walk. Stephen had a brilliant idea, as usual. Before it snowed we had noticed that Mia loved playing in some straw that was laying in the yard. She would play, nose around and poop and pee in it. He suggested that we put straw in the potty area where we are trying to get Mia to go to the bathroom. As soon as Mia saw the straw she played in it. The second time I took her out she ran to the straw as fast as she could and peed along the edge. She then ran around the straw as if she was chasing a mouse. The silly puppy. The third time she ran over and immediately pooped in it. "Good girl, kid. I like leaving loot in this stuff, too." Mia went to the front door and stood there. I opened the door and she jumped off the step leading to the porch and proceeded to go to the yard where she pooped. Yay! Good girl, Mia. Here's a treat. Mia was playing with her toys. She started to whine and pace. Stephen stood up and walked to the door. Mia ran to the door and Spencer followed. Stephen opened the door and Mia ran outside and straight to the straw pile where she proceeded to pee. She then ran back to the porch. Stephen started picking up some firewood to bring into the fireplace and when he turned around Mia was gone. He looked for her and spotted her back at the straw pooping. Good girl, Mia!! The same day...I also found some dried up pee in the dining room I had not seen before. I don't know when she did it, but it was not done today. It had been there for a while. I cleaned it up and let some deodorizer spray soak into the wood. Housebreaking is a process. Some pups pick up on it right away and some need time. I think Mia would be one of those pups who would get it right away if it were not for the bad winter weather. But we are making progress. As long as I keep seeing progress.... That is all one can ask for. "It wasn't me. Oh no, Bully Pits don't do things like this. It must have been the Boxer. Ya, that's it. It was Bruno. What? You say you saw me do it? Oh, well this is your fault, you know. You humans have not made this rule clear enough. I'm just an innocent young pup." Mia had been up since 5:30 a.m. It was now 9:00 a.m. and she was still up playing with her toys. She had been out several times, including coming with me during morning farm chores. Suddenly she squatted right in front of me. "Hey!" Mia stopped mid-pee and took off in the other direction. This time, instead of grabbing her and running out the door, I took the time to grab a bag of treats and lure her out to the hay, where I pointed at the ground. She looked up at me as she peed knowing there was a treat coming. Good girl, Mia. Then we headed inside for a picture. All the while the pee was soaking down into the floor. Oh, the poor floor. I used a paper towel to soak up as much as I could. I cleaned it with odor eliminator cleaner and then let the cleaner soak down into the wood to try and neutralize the smell. Ever since it snowed Mia has been curiously watching Spencer and Bruno as they happily run through it. It was as if she could not figure out why they would seem so happy over this cold, wet stuff that covered up all the loot. But wait...was Spencer looking for loot under the snow? Mia surprisingly took off into the snow after Spencer. "Spencer, Spencer, what ya doing?" "Are you looking for something? Are ya, are ya?" "Are ya sniffing something out? What is it? Tell me, tell me!" "Spencer, wait for me. This is rather fun!" Mia gets into these moods where she barks at Bruno and/or Spencer as she bites on them. It looks like play and she is playing, but she's sassing and harassing them at the same time. I realized it was too much when Spencer decided he would rather spend time out in the cold than be inside the house with her when she's wound up. It's time to step up the rules in the house. No harassing the bigger dogs. No barking at them and no running up and chewing on their faces. Leave them alone when they are sleeping. No trying to steal their toys out from under them and no pushing them out of the way while they are drinking. You hear that, little miss sassy-pants? You are going to pipe it down. You are stressing out your older brothers. Mia, you are getting awfully bold with that cat. Hey! Stop trying to chase it! "Leave it!" Mia, stop trying to take that bone from Bruno. "Hey!" This picture was taken after she had tried several times to take his bone and I had stopped her. She had finally given up. Bruno had just moved the bone to the bed after trying to get away from her. "Who, me? You talking to me? Do I look like I'd be a bone stealer? I'm just a cute, little innocent puppy, that's what I am." Mia was lying in the dog bed next to Stephen's desk. Stephen started playing his bass guitar and Mia took off running into the kitchen. "What the heck was that?!" It scared her. I walked into the room and noticed Mia in the kitchen, peering around the corner. 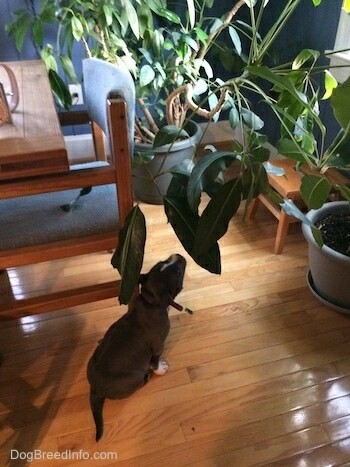 She was curious but afraid to come check out what that was. Without saying a word to Mia or acknowledging her at all, I squatted down facing Stephen to give her a safe place to move in closer to the noise that was freaking her out. Stephen had stopped playing for a second and Mia ran to me and stood between me and the chair—a place to get closer yet be safe. I still did not acknowledge Mia. She needed to get over it on her own. I did not want to give any type of rewarding reaction to her fear by sweet talking her. That would be like saying, good girl for not liking that noise. Good girl for feeling like this. Instead, I spoke to Stephen. I asked him to play his bass again. He started playing and I stayed there, talking to him only and letting Mia see that neither of us were afraid. We were rather relaxed and calm. The humans were not worried about a thing and yet the noise was still playing. Eventually, I stood up. Mia stayed with me for a minute longer and then she walked further into the room and lay down with Bruno and Spencer and went to sleep. All while the noise kept playing. The noise was not so scary anymore. No one else in the room was afraid of it. When Stephen started playing louder, Mia woke up and looked unsure again. Word spread through the house, "Don't pet Mia. She is afraid of the bass. Ignore her." Mia walked around the house looking from one person to the other. Stephen playing his bass, Sara making a cheesecake with her electric mixer and Amie working on her laptop in the kitchen. All these things going on at one time. So much to take in for a young puppy. Mia sat there soaking all of this in for a while. She started looking more relaxed. Afraid Mia might have to pee, I grabbed the treat bag and shook it. Mia ran right past the electric mixer, past the bass, which was still playing, very happy to follow the scent of the treat out the door where she peed. I gave her the treat and she walked back inside the noisy house. Things were not so scary anymore.